Washington remained at No. 4 in both the Associated Press and coaches polls, but the one that counts — the College Football Playoff rankings — will be released Tuesday. 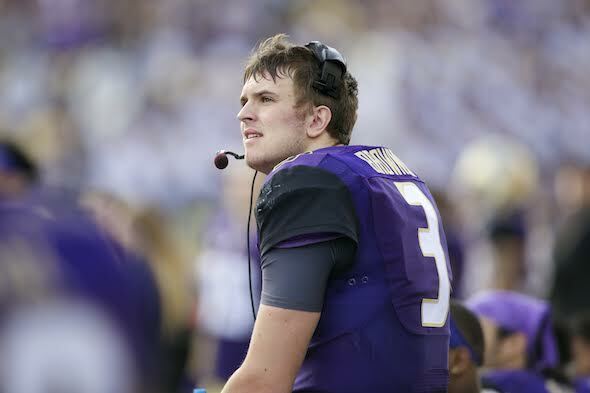 Washington’s 66-27 rout of unranked California late Saturday night predictably did nothing to elevate the Huskies in the Associated Press and coaches polls released Sunday. They stayed at No. 4 in both due to impressive wins by the three teams ahead of them, but the poll that now counts most — the FBS College Football Playoff rankings — will come out at 4 p.m. Tuesday. Washington was No. 5 in the initial CFP ratings last week behind No. 1 Alabama, No. 2 Clemson, No. 3 Michigan and No. 4 Texas A&M. But the Aggies lost Saturday, 35-28 to unranked Mississippi State, providing the Huskies an opportunity to vault into the top four. They took advantage with their overwhelming win at Cal, but it’s possible that No. 6 Ohio State could leapfrog them due to the Buckeyes’ 62-3 shellacking of No. 10 Nebraska. The Buckeyes’ 59-point win matched the second-most lopsided win between two top-10 teams in AP rankings. No. 1 Army blasted No. 6 Penn 61-0 in 1945. A top-ranked Army team also trounced No. 2 Notre Dame 59-0 in 1944. Even with an historic rout, Ohio State didn’t make such a move in the AP poll released Sunday, coming in at No. 6. The Crimson Tide (9-0) remained No. 1 with 1,524 points after blanking LSU 10-0. Alabama was followed by No. 2 Michigan (9-0, 1,432 points) and No. 3 Clemson (No. 3, 1,398). The Wolverines smacked down Maryland 59-3 while the Tigers blasted Syracuse 54-0. Washington, 9-0 for the first time since 1991, collected 1,364 points — five fewer than last week’s 1,369. Louisville (8-1) is No. 5 (1,255) and Ohio State No. 6 (8-1, 1,245). Utah (7-2), 16th in last week’s AP poll, moved up three spots to No. 13 (686). Colorado (7-2), 21st last week, jumped five spots to 16th (550) — its highest ranking since December 2002 — and Washington State (7-2) went from 25th to 23rd (305). The Cougars clobbered Arizona 69-7 Saturday in Pullman. In the coaches poll, Washington received 1,422 points to trail Alabama (1,598), Clemson (1,497) and Michigan (1,493). Ohio State moved up to No. 5 with 1,316. Among Pac-12 schools, Utah jumped from No. 16 to No. 12 (788), Colorado from No. 20 to No. 15 (627) and Washington State from No. 25 to No. 23 (331). USC (79) and Stanford (2) also received votes. Washington hosts USC (6-3, 5-2) at 4:30 p.m. Saturday (Fox). The Trojans are riding a five-game winning streak, longest since 2013. The 66 points by Washington Saturday night were the most against Cal since a Gil Dobie-coached UW team beat the Bears 72-0 in 1915. QB Jake Browning has a school-record 34 TD passes, one more than Keith Price in 2011 . . . Browning’s six TDs vs. the Bears tied his own mark, set at Oregon Oct. 8. He is the only FBS quarterback to throw six TDs in a game twice this year . . . Browning has four or more TDs four times this season, another school mark. WR John Ross, who had TD catches of 60, 67 and 6 yards against Cal, finished with 208 yards. He is the first UW receiver to exceed 200 in a game since Charles Frederick had 216 at Oregon State in 2003. Ross also caught three TDs at Oregon . . . Ross has 14 receiving TDs, second most in UW history. The single-season mark is 18 by Mario Bailey in 1991. WR Dante Pettis is the first FBS player with three receiving touchdowns (1, 17, 32 yards) and a passing touchdown (39 yards to Darrell Daniels) in the same game since 2012 (Josh Lenz of Iowa State against TCU). Pettis and Ross are the first UW receivers with three TD catches each in the same game. Browning is the only QB with a QBR over 200, @ 202. 2nd is at 194 and the Heisman leader, Jackson of Louisville, is @164. UW started the game a bit on the sloppy side and Cal really had no business finding the end zone against them. If the Huskies could have kept them to a 2 or 3 FG’s maybe they could move up to #3 but that would probably have been wishful thinking. It should be noted that Browning is the only QB this season to have 2 games with 6 TDs. This year’s Apple Cup is going to be fun.